“Paul Dale Anders…son,” the women sang. They broke my name up into two stanzas of two syllables each, placing the emphasis on the second syllable. It became a magical chant. So rhythmic. So hypnotic. So simple. Louisa and Virginia were my two partners in crime on the Faking it in Fandom panel at Windycon, the Chicago-area science fiction and fantasy convention November 10-12 in Lombard, Illinois. It turns out they were also heads of the programming committee who made panel assignments. When they came across my name, they didn’t know what to do with it. It was much too long to fit on name placards. So they shortened it to Paul Anderson. And it became simply P. Anderson in places on the printed program. Anyway, they sang my name. They claimed my name was musical, and they really made it sound like music. Paul Dale. Anders Son. Paul Dale. Anders Son. One of the reasons I used to use pen names was the unwieldy length of my full name. I also needed to include Dale to differentiate myself from authors like Poul Anderson and Paul Michael Anderson. That made my name too long to fit easily on book covers or spines and on convention badges and placards. And one of the reasons I’m not better known in the sf community is because my name often gets truncated on programs, name badges and placards. My father was Paul Anders Anderson, and I really am Paul Anders’ son. I lived the first twelve years of my life as Dale Anderson. My parents, relatives, and friends all called me Dale to differentiate me from my dad. Some of my friends still call me Dale. Because editors found it difficult to include my full name on book and magazine covers, you can find some of my novels with only Paul Anderson on the spine. I used Dale Anders as a pen name for a while. It proved useful for contemporary romances and erotica. My first story in The Horror Show bore the Dale Anderson by-line. But I prefer to use my full birth name for fantasy and horror. 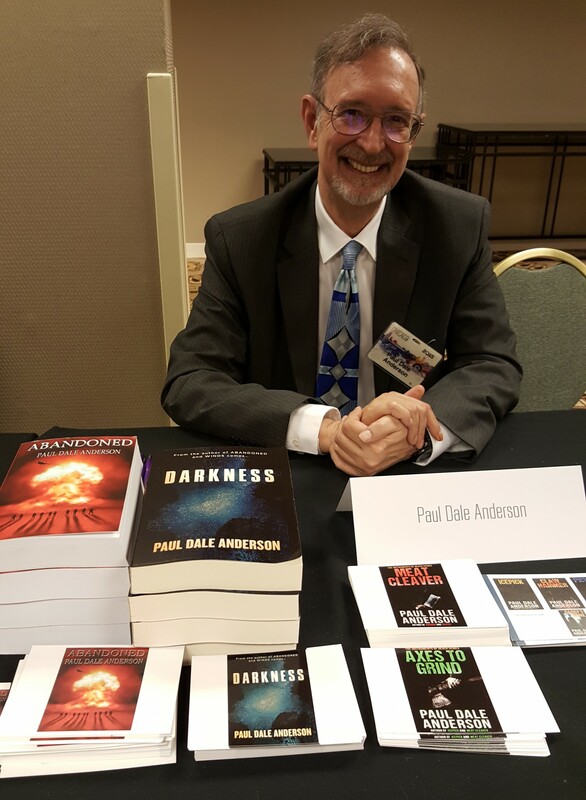 Maybe Paul Dale Anderson doesn’t sound as scary as Stephen King or Dean Koontz. Try punctuating it. Paul Dale. Anders Son. Yeah. Just be glad your name isn’t Elizabeth Aisling Flygare. No one can spell it, few can pronounce it; sometimes I’m not even sure I can pronounce it! It’s also very musical. And so are you. Love it, Paul!!! It’s gonna stick in my head from here on out. I was honestly shocked to hear how often my name was bandied about behind my back. What shocked me more, though, is how few fans remember an author’s name or titles of written works. Richard Chwedyk, a Nebula Award winner and frequent contributor to F&SF, lamented the forgotten authors whose names once adorned the sf magazines. Richard, Tina Jens, and I have been friends for 30 years or more, and we’ve appeared at Windycons, World Cons, and Nebulas–autographing, reading, on panels, or teaching workshops–since the 1980s. But few fans remember our names or our works. On the bright side, each time I do appear, I make new friends and sell more copies of my books.